OAK LAWN, Ill. (WLS) -- One of two dogs died after someone dropped them from the top floor of a parking garage at Advocate Christ Medical Center in south suburban Oak Lawn, police said. Officers responded just after 12:05 p.m. on May 20 to a report of two injured dogs between Towers B and C near West 93rd Street and South Kilbourn Avenue. The dogs were described as white toy poodles. They rushed both dogs to the Animal Welfare League in nearby Chicago Ridge, police said. One of the dogs died. 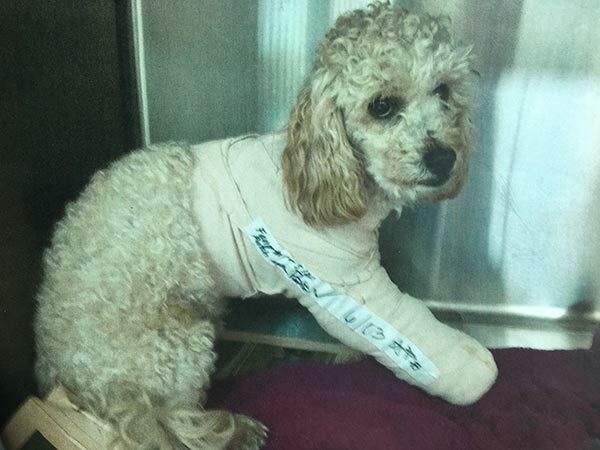 The other dog, named Angel, sustained a broken leg and bruised ribs and will undergo surgery Tuesday. "His leg is broke, he's got hip pins, two pins in it, and his ribs are real sore," said Linda Estrada, Animal Welfare League. "It's a good five-story fall. It's unbelievable." Angel is just over a year old, 12 lbs., and is the son of the dog that died, officials said. "I can't imagine why somebody would do it," said Division Chief Randy Palmer, Oak Lawn police. "I don't know if this individual went there with that specific intent of doing and at some point that did entire his mind, and carry out the act." The dogs' proper owner was overcome with emotion when he came in to claim him. "He's a big elderly man, and just crying his eyes out. He said 'These are my babies. Why would someone want to hurt my babies?'" Estrada said. Oak Lawn police said Monday afternoon that their investigation resulted in an arrest and a person being charged with two counts of felony animal cruelty. The Cook County State's Attorney identified the suspect as 22-year-old Edward Hanania of Oak Lawn. "I would just like to say to him why? Just why?" Estrada said. Investigators said preliminary evidence shows someone dropped both dogs from the top floor of Tower C. Police said the dogs' owner and Hananla do not appear to be connected or to have known each other.